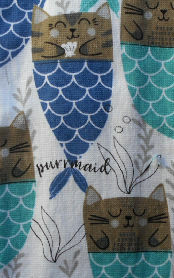 This kitchen towel features a cat mermaid or purrmaid. The kitchen towel is 16" wide x 25" long, 100% cotton, finished edges. The towel has a smooth finish on the side with the image. On the reverse side is terry.